Patrick Hook, vice president of Operations for American SpiralWeld, stands before a sign of products the company manufactures, during a press conference last week announcing plans to build a plant at the former Buick City site. FLINT TWP. — Welding skills in particular could help land one of 50-60 manufacturing jobs coming next year with the opening of an pipe making plant on the site of the old Buick City complex in Flint. American Cast Iron Pipe Co., based in Birmingham, Alabama, announced at a press conference Nov. 13 that it will build a 200,000 square-foot factory on approximately 18 acres of the sprawling 413.6 acre former automotive complex. 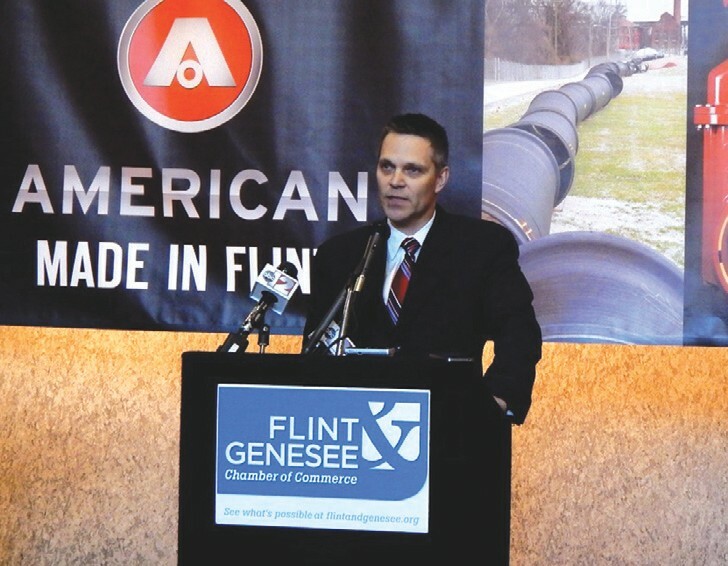 The plant will manufacture SprialWeld steel pipe for the Karegnondi Water Authority (KWA) pipeline being built from Port Huron to Flint to serve Sanilac, Lapeer and Genesee counties which covers more than 2,400 square miles. American was recently awarded a contract to supply pipe for the Karegnondi water line now under construction. 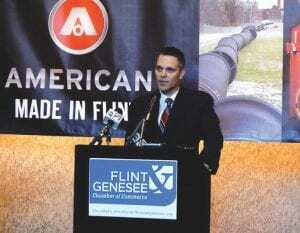 Construction on American’s pipe plant could begin as early as January with plans to complete hiring by September and be up and running by late fourth-quarter of 2014, said Patrick Hook, vice president of operations for American SpiralWeld, speaking during the press conference at the Flint & Genesee Chamber of Commerce. The plan is to start with a one-shift operation with the hope of adding more shifts as more business is found, Hook said, noting that he facility will be a longterm investment in Michigan beyond building the pipeline. Hook would not say how much it will cost to build the facility but did say that it will be several million dollars. He said the company intends to hire locally as much as possible and will be particularly looking for workers with welding or heavy industrial experience. American’s commitment was hailed by local leaders as a rebirth of the former Buick City complex which closed completely in 2010 and has undergone a lengthy brownfield cleanup process. He credited a unique relationship with the EPA that helps RACER to successfully address issues at brownfield redevelopment sites. “It is really important for the EPA to have these properties redeveloped and contribute to economic growth and contribute to redevelopment of the cities where the auto industry has made changes and left these properties,” she said. Guerriero took the opportunity to announce a recent $9.1 million trust fund settlement for remediation at the former Delphi East site, paving the way for future redevelopment there. Jamie Curtis, chairman of the Genesee County Board of Commissioners and member of the KWA board said that Buick City redevelopment held special meaning for him because he worked for Buick Motor Division for 30 years. “I can close my eyes and see what used to be and now with my eyes wide open I can envision what will be,” he said. The pipeline is the culmination of more than 15 years of work by leaders who embraced the idea that more could be done working together than individually, he said. American’s decision to build a plant in Flint is a direct result of that vision. U.S Congressman Dan Kildee also issued a congratulatory statement.